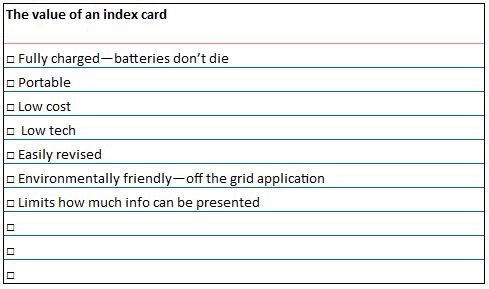 Index Card Cure™: Why an index card? For the final exam of my [mandatory] electrical engineering (EE) class, we were able to take in one page of equations, student’s choice and creation. Like many of my classmates, I spent my study time creating a masterpiece of tiny print, with every space covered. But during the exam, I found that the sheet didn’t help. It was more frustrating than helpful because it was too hard to find the right info. The preparation served as a review, but not so much for reference. I passed the course, but not because the equation sheet gave a significant advantage. Just like with my EE exam sheet, too much information or too many choices are barriers. For instance, think about walking through the grocery store. Unless you are hunting for specific brands, the cereal or pet food aisle can be mind-boggling. How do you decide? Research shows that too many choices can cause us to walk away without making a decision. If we’re researching an electronic device for purchase, when we FINALLY choose, the item may already be obsolete. And after we decide, we may end up second guessing about whether we could have done better. So, Index Card Cure™ set limits by using a small card. There is only so much space to write. Maybe, that’s enough. And while we are talking about analog cards, the same thinking can be applied to a digital version, using a smartphone or computer app. Productivity programs such as Evernote can help record and retrieve information and lists. When I walk in the morning, I carry cards and pen to capture ideas or things to do. I like the time untethered from the grid, though others might prefer to use their phone for note taking. Whatever works. A guiding principle: As much as necessary; as little as possible.